190 yards, uphill and into the wind. Drew said "I always hit this green." Then he stepped up to the tee and did exactly that on the way to a par. An impressive spit in the eye of the golf gods. I also had a good hole, hitting my favorite shot of the day. Uphill and into a stiff wind, I figured this hole played 215 yards with a lot of trouble short. If I had my regular clubs in SF I would have used my hybrid, which I can hit 205 on a good day. But here I had my old clubs, and nothing between the the 3-1ron (185 yards) and the driver (245 if I hit it right). I took note of the 12 foot grey rock wall backstop behind the hole and called my shot "I'm using my driver, off the backstop and on to the green." Drew gave me a puzzled look. I stepped up and hit a rifle shot, right over the pin and squarely into the rock wall behind. It caught a funny angle and didn't quite make it back to the green, rolling just short on the fringe. Drew said "I thought it was going in the hole." As a guest on a course, it is fun to impress a member. He'd never seen that hole played that way. Two putt from the fringe for a par. 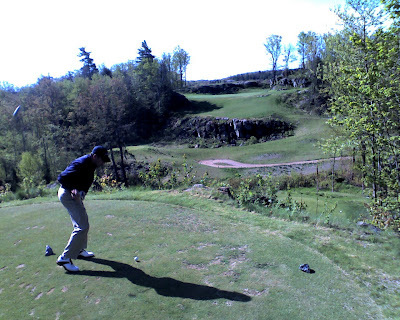 If I ever get back to Greywalls, I'll play this hole exactly the same way.